A surgical team at Swansea’s Morriston Hospital, Wales, United Kingdom has created a technique to reconstruct jaws affected by cancer using 3D printing, said to be one of the first of its kind in the world. And one of the key surgeons of team is from Belagavi namely Dr Madhav Kittur and he is the son of noted surgeon Late Dr Anil Kittur. Madhav Kittur [BDS, MDS (OMFS), FDSRCS, MBBCh, MRCS, FRCS (OMFS)] did his schooling from St.Paul’s high school Belagavi. Later studied in JNMC Belagavi and then SDM college. Store worker Debbie Hawkins from Swansea was the first patient to have the “amazing” procedure. Surgeons rebuilt a section of her jawbone after she developed a tumour. The method uses 3D printed titanium implants that are anatomically specific to the patient. The technique combines traditional bone grafts with 3D printed titanium implants that can be created to fit an individual patient’s anatomy. She was in hospital for just two weeks after her operation in August last year, which also used 3D technology to plan the operation in advance. She was able to return to work after three months. 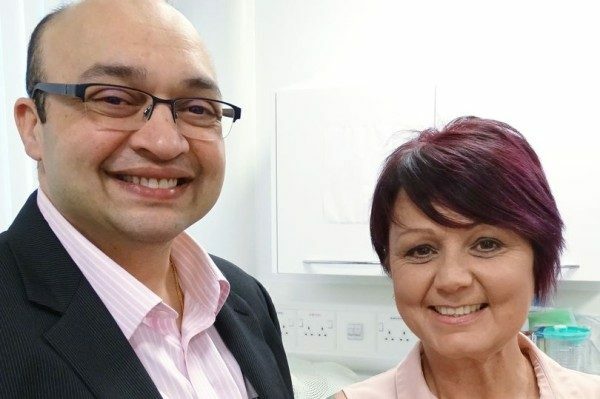 Ms Hawkins’ consultant surgeon, Madhav Kittur, said five procedures had already been carried out at Morriston, with a sixth in the planning stage. He added: “It has taken away the uncertainty. We know exactly what is going to happen before we go into theatre as everything is computer planned. “This can save a lot of time – up to two hours. On average this operation takes eight to 10 hours, so when we take two hours out of that it is quite a sizable reduction. “This is a big advance. It’s better aesthetically, the patient is under anaesthetic for less time, and recovery is better. Surgeons removed and rebuilt a section of Debbie Hawkins’ lower jawbone after she developed a tumour – which had grown to the point where there was a risk it would have broken her jaw. Surgeons traditionally used a length of fibula taken from the leg to replace sections of jaw which had to be removed because of cancer. This method often compromised the shape of the jawline, or meant the jaw was set too low to allow for dental implants. Morriston’s 3D technology uses the patient’s CT images to design an anatomically-accurate titanium implant which fixes the fibula bone in place and maintains the aesthetic shape of the jawline. The team also creates cutting guides so that the bone taken from the fibula exactly matches the removed section of the jaw. Dr Madhav Kittur is dually qualified in Dentistry and Medicine. He completed his primary dental qualification and Masters degree in Oral and Maxillofacial Surgery in India. His medical qualification is from Cardiff University. He completed basic surgical and specialist training in Oral and Maxillofacial Surgery in South Wales. He has also completed an Interface fellowship in “Therapeutic use of Lasers”. Towards the end of his training he spent time at The Ninth People’s Hospital in Shanghai to gain further experience in advanced head and neck surgery and microvascular reconstruction. On completion of his training ABMU Health Board appointed him as a consultant in Oral and Maxillofacial Surgery. Mr. Kittur is on the specialist lists for both Oral and Maxillofacial Surgery (held by the General Medical Council) and Oral Surgery (held by the General Dental Council). He practices the entire range of Oral and Maxillofacial Surgery but has a special interest in oral cancer and microvascular reconstruction. Mr. Kittur is the author and co-author of numerous publications in specialist journals, and has presented papers at national and international meetings. Mr. Kittur is committed to teaching and has been actively involved in teaching dental and medical practitioners. Doc Madhav congrats…..nice to have on the same bench in Tantri Class……keep it up …..when you visit Belgaum in KLE dental college we need a lecture and conversation with staff….and is imp….we at KLE have a dream to get this done…..soon….. So proud of you Madhav! Any idea what batch (St. Pauls) ?